The largest tourist resort in France is the city of Nice on the Cote d'Azur of the Provence. The azur waters of the Mediterranean Sea lap at the shores of Nice, on the French Riviera. The narrow alley ways and lanes of the Old Town seem to spill out onto the sandy beach. The city of Nice features many fine examples of religious architecture dating back to the 17th Century. City of Nice waterfront and Old Town seen from the Parc du Chateau, Riviera, Provence, Cote d'Azur, France, Europe. 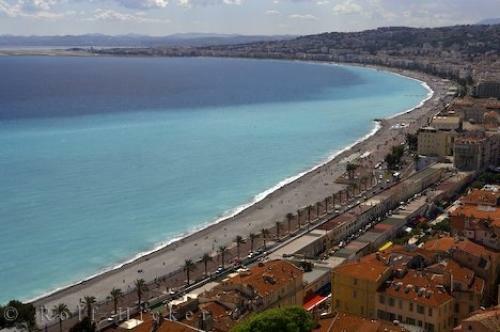 Photo of beach and old town of Nice on the Cote d'Azur in the Provence, France.